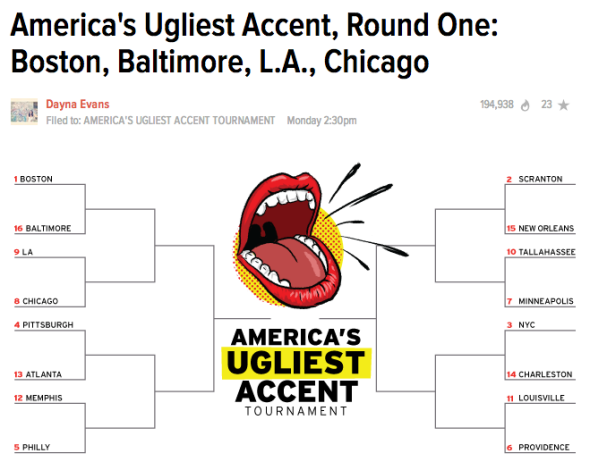 Gawker is running a competition, tournament style, to see which accent will be crowned “America’s Ugliest.” In the running are 16 cities in the US, and readers get to vote. As a linguist, I’m not so thrilled about it. I’ll get to the principled sociolinguistic reasons why I don’t like it in a moment, but on a personal level I was upset to see that in the intro to the piece they’d linked to a column that referenced research I’d collaborated on about the Philadelphia dialect (they’ve since removed that link after I asked them to). If you don’t know much about how sociolinguistic research is done, many of us rely on the goodwill and generosity of strangers to invite us into their homes, and tell us a bit about their lives for an hour or so. What they tell us teaches us about the social landscape of language, and how they tell us teaches us about language use. This is all crucial knowledge that lies outside the walls of academia, and if people started refusing to speak to us, we’d be pretty screwed! I don’t want anyone who I might want to interview in the future to be confused about my purposes because they saw my name or my colleagues’ names when they followed a link from “America’s Ugliest Accent Tournament.” I also feel an ethical obligation to them to provide a vigorous public defense if their communities and the way they speak are ridiculed on the back of the research I’ve done. New Orleans is a steaming, fetid stew of aural bile, home to everything from the deep Cajun bayou accent to the Yat dialect, which derives from Irish, French, German, and even Italian into one completely incomprehensible mess. You need only watch this clip on the number of ways residents pronounce the city’s name and neighborhoods and read this excellent article on the hodgepodge of New Orleans’ accents to see how varied, and uniformly ugly, it all is. It’s a working class language, probably, is what it amounts to. And of course, that’s what linguistic discrimination is really about. Maybe it’s not always about class, but it’s never really about language. It’s about the kind of people who speak it. Predictably, the kinds of accents and languages which get dumped on the most, and get branded the “ugliest,” always wind up being spoken by socially disadvantaged people. What exactly did this woman in particular do to deserve having a candid video of her slapped up on Gawker as an example of just how “ugly” the Chicago accent is? She works in a warehouse supermarket, that’s what. Linguists call this general pattern “standard language ideology.” It’s the idea that somewhere out there, there’s a perfect, unadulterated version of English, and what your everyday person speaks is a poor copy. I call it the kilogram model of language, because there is literally a physical object in France by which the unit kilogram is defined, and there are in fact multiple and worryingly imperfect copies of it around the world. But what linguists have discovered is that language is definitely not like the kilogram. The only place where English really exists is in the minds of its everyday speakers. To the extent that varies geographically and socially, so does English. There are no imperfect copies. In her textbook English with an Accent, Rosina Lippi-Green sums up my own opinion on the matter, but I’ve added some emphasis. If as a nation we are agreed that it is not acceptable or good to discriminate on the grounds of skin color or ethnicity, gender or age, then by logical extension it is equally unacceptable to discriminate against language traits which are intimately linked to an individual’s sense and expression of self. Real quick, let’s contrast the overall tone of the America’s Ugliest Accent Tournament with what I would call the fundamental sociolinguistic outlook on speakers. I think Bill Labov, the founder of contemporary sociolinguistics, summed it up nicely at the end of his 2009 Haskins Prize lecture. Transcript: I am not playing the part of a doctor, introducing you to my patients, nor that of a lawyer introducing you to my clients. These are people I have learned from. They are a small sample of many thousands. I have chosen them because they each possess an uncommon eloquence—a mastery of the English language that allows them, each in his or her own way, to share with us their experience in life and their view of the world. Over the years, their words have had a profound effect on me. I do not know when it happened. I suppose that like most linguists, I was always in love with language. But somewhere in this business of listening to people I found that I had fallen in love with humanity. If this talk has succeeded, you will, to some small degree, have done so as well. One thing that every sociolinguist knows is that people (including ourselves) find accents and dialects endlessly fascinating. Just look at how the New York Times Dialect quiz became the most visited story of 2013. It makes sense that Gawker would want to cash in on that dialect goodness with an eight item long user engagement feature. But why did it have to resort to such a nasty and damaging attitude? It’s probably in part because standard language ideology gives us almost no other way to talk about accents but negatively. Having a bracket for the most “interesting” or “vibrant” or “beautiful” accents would probably come off as weird, and that’s too bad. At the risk of coming off as a slacktivist, I’d encourage you all to be the change you want to see in the world, and say something nice about an accent today, even if it’s just your own. A version of this post appeared on Val Systems.